An Atlanta slum. A pod of whales off the coast of Alaska. The prisons of Peru and Chile. The plays of Shakespeare. A health club in Chicago. For those with eyes to see, traces of God can be found in the most unexpected places. Yet many Christians have not only missed seeing God, theya (TM)ve overlooked opportunities to make him visible to those most in need of hope. 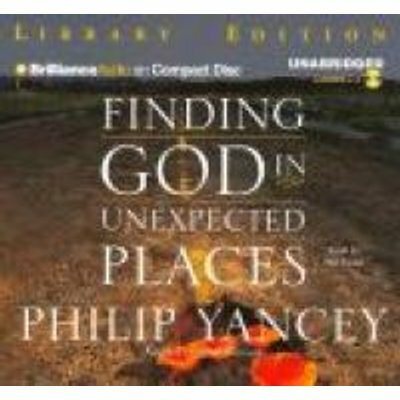 In this enlightening book, author Philip Yancey serves as an insightful tour guide for those willing to look beyond the obvious, pointing out glimpses of the eternal where few might think to look. Whether finding God among the newspaper headlines, within the church, or on the job, Yancey delves deeply into the commonplace and surfaces with rich spiritual insight. Finding God in Unexpected Places takes listeners from Ground Zero to the Horn of Africa, and each stop along the way reveals footprints of God, touches of his truth, and grace that prompt listeners to search deeper within their own lives for glimpses of transcendence.